The Heywood diner and truckstop is a little bit different to many other establishments featured in TSN of late in the fact it’s not really used by the general public. That is because its on the Heywood Distribution Park and to gain access to it, you have to go through a manned, gated security barrier. 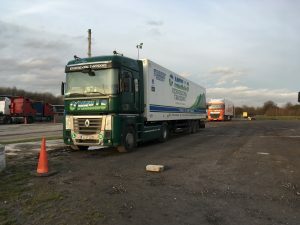 That gives drivers that added sense of security when they park for the night and also means its geared up solely for lorry drivers and you won’t see families getting under your feet or beating you in the queue! 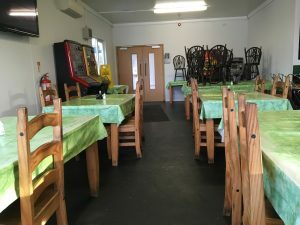 Inside the diner – which can seat up to 50 drivers – could be described as a little down at heel, and you could argue it could do with a bit of a refresh. The green plastic tablecloths are not especially nice! But most drivers won’t complain if they get a food meal at a decent price. 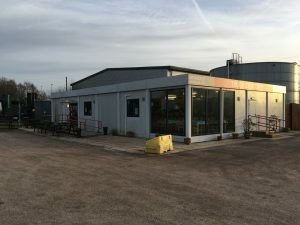 That said, the site does offer a good range of food though at acceptable prices and the quality is ok.
A Full English costs £6.50 and gives you two eggs, two rashers of bacon, two sausages, beans, mushrooms, tomatoes, toast and either tea of coffee which is refillable, so actually represents very good value. A bacon sandwich of £2.40 as is a sausage sandwich, and both is £2.80 as is either with an egg. All three in a sandwich is £3.40, and with the addition of cheese, it’s £3.90. Toast and butter is £1.20, with 20p extra for jam or marmalade. Tea a pound, coffee is 20p more. Hot chocolate sis £1.50 while bottles drinks are £1.30, cans are a quid and water is 90p a bottle. Paninis are in the £3.60-£3.90 range and feature Ham & cheese, steak, cheese and peppers, tuna mayo – with or without sweetcorn and chicken with roast vegetables. Extras are 60p each. Jacket potatoes are in the £2.80-£3.70 range depending on what filling you choose. The cheapest is the plain spud with just butter but filling options are cheese, beans, tuna mayo, egg mayo and chilli con carne. Again, extra fillings are 60p a go. There is a selection of cakes available, all priced at £1.30, while chocolate bars are 80p, biscuits 30p and packets of crisps 60p. There is a daily specials board and the special is priced be £7 – ask for details when you visit. 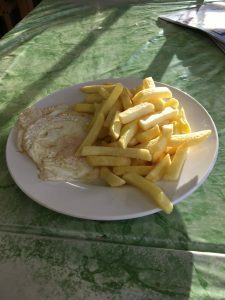 Gammon eggs and chips is £8, sirloin steak, chips, peas and salad is £8 as is scampi, chips and peas or a mixed grill. Half a chicken with vegetables and potatoes is also £8 as is gammon, sausage, egg and tomatoes while black pudding tomatoes and chips is £7.50. It has Showers, TV and a cashpoint and there is free wifi. CCTV, and employed parking attendant and security guard will add to the security. The lorry park surface area leaves something to be desired as well. This is a classic, almost stereotypical, truckstop. 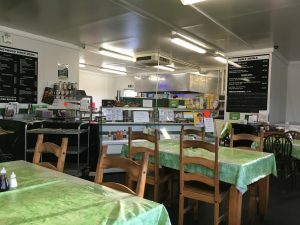 It is clean, provides good honest food at a decent price, but it could do with a refurbishment and more facilities such as a bar or a shop and maybe a wider choice on the menu. Security and capacity is its biggest plus points and it sits mid table in terms of pricing and quality. That is no bad thing, it’s much better than being at the bottom of the league!